To celebrate my new quilting fabric collection, Coastal Orchards for Benartex, I designed a free quilt pattern! It is called Flitting. Flitting was inspired by the swooping of butterflies as they flutter through orchards and gardens. When photographing a butterfly in flight, it is almost impossible to get a crisp shot that showcases the butterfly’s wings. Instead each snapshot captures the butterfly at a different angle with their wings at different levels of extension. 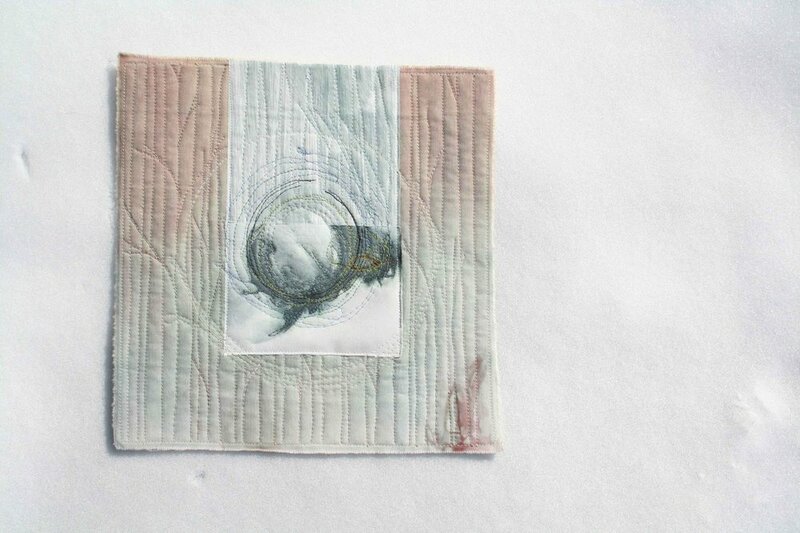 This quilt represents that beautiful but erratic flight. This quilt pattern is definitely beginner-friendly but offers a finished product that looks more difficult than it is. Confession: The hardest part for me was remembering which of my light-colored fabrics corresponded to which fabric in the pattern. That’s why in the pattern I suggest creating a cheat sheet for yourself! This quilt introduces the hourglass block (also sometimes referred to as the quarter-square triangle), and it is one of my favorite blocks. I love how easy it is to make four hourglass blocks at once, and I enjoy playing with how much white fills each block. Check out my Hourglass Block Tutorial to see pictures and read tips. It’s done!! My Black and White Twelve Quilt, inspired by Piecework Collective’s Black and White quilt show in 2016, is the largest overprinted quilt I have tackled to date! With the creative restrictions of black and white, I strayed from my standard light grey and white geometric quilt top and played with a different neutral: cream. Although it felt like a stretch at the time, I now regularly keep cream in my quilting line-up. 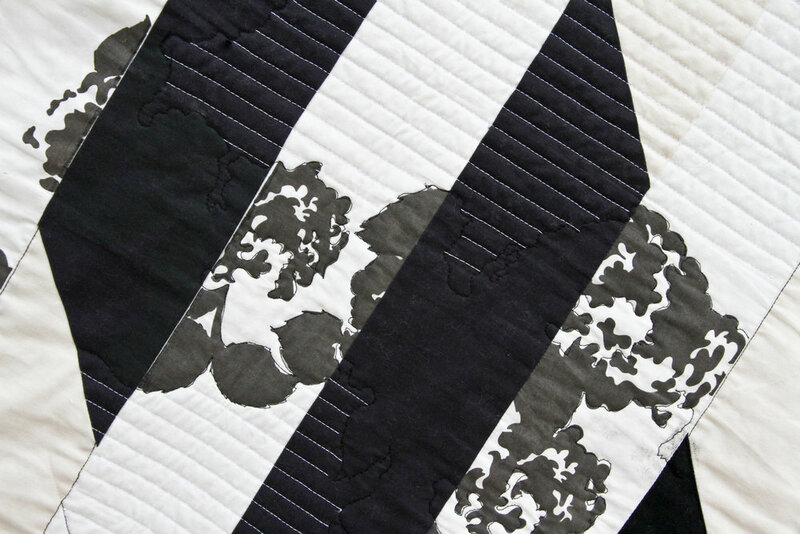 The resulting subtle play between the cream and white and the dark grey and black adds gentle movement while imbuing the quilt with a warmth that a cooler lighter grey does not provide. For this quilt, I also experimented with piecing the quilt top halfway, screen printing blooms, and then finishing the piecing process. Previously I either printed on a completely pieced top or a completely pieced and quilted top, never part way through the piecing process! It definitely adds some waiting time as the screen printed blooms need to dry before the quilt can be stitched up further, but I love how this printing process causes the flowers to weave through the quilt, contrasting organic with the architectural. The quilting took me years. Literally. Started in 2016, this quilt has been in process a long time, but while trying to finish my PhD last year, the seemingly endless straight-line quilting offered me a methodical and restful rhythm. I am excited to have it finished at last, and I am pondering what it would mean to tackle a quilt of this magnitude again. Although I enjoyed the process, I think I may collaborate with a long-arm quilter next time. That said, it would be hard to let go of total control…I guess only time will tell! Every Lenten season, I take a break from my current quilting projects to feast into creativity. The first year, this meant a 12"x 12" mini quilt every week (hence the original name "Lenten Twelves"). The next year was a series of baby quilts. Last year was a series of printed quilts. This Lenten season, I am exploring double wedding ring quilt blocks and the stations of the cross. The double wedding ring block carries double meaning for me. For one, it has significance as I plan my wedding and prepare for marriage. However, it also feels like an apt block to explore during Lent as we contemplate Jesus coming to the world to take the church as his bride. While visiting the National Gallery of Art in Washington, DC last fall, I came across Barnett Newman's Stations of the Cross. Minimal in black and white, the room was incredibly meditative, and I have mulling over their simple power ever since gallery. With Barnett as inspiration, I am spending this Lent working in shades of black and white and loosely exploring the stations of the cross. The 14 stations of the cross are intended to be meditations that center around the day of Jesus crucifixion, following the story from when he is condemned to die to when he is placed in his tomb. My first block is titled: Prayers in Gethsemane. At this moment in the story, Jesus has finished the Last Supper with his friends, and the full weight of what awaits him next is sinking in. Since he is God, he knows that he needs to die in order to atone for the sins of the world, but he is also human and is overwhelmed at the thought of being crucified. Together with his friends, he goes to the Garden of Gethsemane and asks them to stay awake with him as he contemplates his impending death. Going a little farther, he fell with his face to the ground and prayed, 'My Father, if it is possible, may this cup be taken from me. Yet not as I will, but as you will.' Then he returned to his disciples and found them sleeping. 'Could you men not keep watch with me for one hour?' he asked Peter . . . When Jesus needs his friends' support, they fall asleep. This block depicts the twelve sleeping disciples in grey with Jesus awake at the center. Dark printed foliage covers the entire piece, obscuring the disciples and blending into the night sky. Check out previous year's Lenten Twelves series. Do you wish you could take better photos of your quilts? 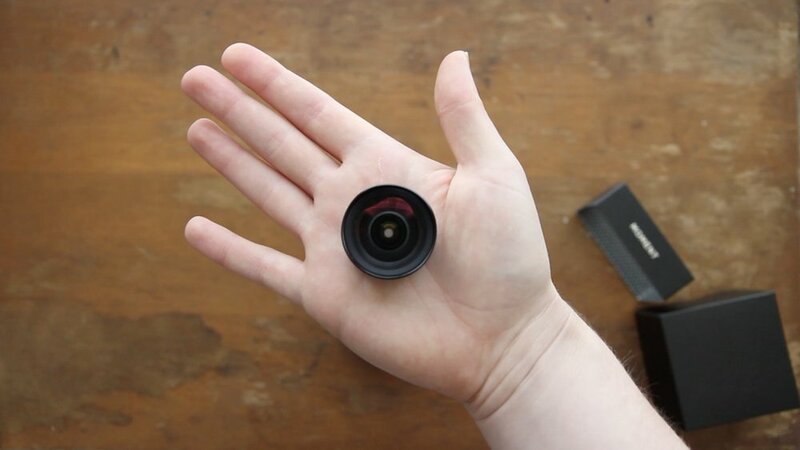 If purchasing a DSLR camera is out of your price range or you want to be able to snap quick, high quality photos with your iPhone, I offer you a solution: a lens for your iPhone. Check out Moment iPhone lenses. They come in a variety of types: wide angle, tele, fisheye, and macro. I have the wide angle lens. It lets me take awesome flat lay photos without having to stand on a chair (as well as gorgeous landscapes when I'm traveling). I have also used my sister's fisheye lens, which adds clarity and flare to any photo, even your thread snippings. Plus, best of all, their lenses are affordable and easy to use. I know I sound like an infomercial right now, but I mean it. Check out the video I made below. Each lens easily clicks onto my phone with the mounting plate stuck to the back. The mounting plate is slim, so it can go inside almost any case you already have. Lenses start at $59 and don't go above $99. To top it off, Moment is just an awesome company. Moment believes in the opportunity to empower the creative in everyone through mobile photography. I am honored to be selected as one of their Moment50 this year, a collection of up-and-coming creatives chosen for their unique work and innovative use of mobile photography. Check out a snapshot of the 49 other creatives below and follow the link to the Moment50 website to see more of their photography and hear their stories. You can see all the photos taken with Moment lenses with #ShotonMoment on Instagram. Best of all, I can offer you a promo code for 10% off! Follow this link to get 10% off your entire order. For many people, having a hobby is a way to reduce stress and fill the days after work is over. But what you may not know is that hobbies can evoke creativity, boost mood and self-confidence, and help raise positivity and mental health levels. These days, it can be difficult to find positivity in the world; a single scroll through your newsfeed can darken your entire day. Having a hobby that you enjoy doing can be a great way to feel better about yourself, your life, and your relationships. The wonderful thing about most hobbies is that they can help with depression and other mood disorders. In fact, art therapy is often used to treat depression in individuals who are battling substance abuse or PTSD. There are many different ways you can get creative or simply find something you’re good at and enjoy doing. Here are a few of the best ways having a hobby can help you feel better. Particularly if you suffer from depression, it can be difficult to be social sometimes. One of the symptoms of depression is withdrawal from friends and family, and many individuals find it hard to get motivated when it comes to spending time with others. Having a hobby that you can share with others is a great way to get out there, meet new people, and spend time with people who enjoy the same things you do. Consider joining your local MQG to get out of the house once a month and meet with people who love the same things you do. Hobbies can offer the opportunity to discover new things about your community. For example, if you’re a hiker, you’re in the perfect position to find new places to explore. If you enjoy the art of upcycling, try visiting salvage yards in unfamiliar parts of town. If you enjoy quilting, check out shop hops in your area or road trip to a new fabric store. Better yet, take a few friends with you as you explore local quilt shops. Finding something you’re good at—quilting, drawing, singing, dancing, creative writing—can be enormously helpful in boosting your self-esteem and can help you find new things to like about yourself. There’s a great feeling of accomplishment when you finish a quilt (particularly your first one) or when you complete a big knitting project. Not only does this make you feel good about your abilities, it keeps you coming back for more. It can be difficult to unplug these days, between smartphones, tablets, and laptops. Staying connected all the time can be damaging to your mood and can even lead to sadness and depression, so it’s important to find ways to fill your time that don’t include a constant update of your newsfeed. Sewing is a great way to unplug. Whether it’s by machine or by hand, you can allow yourself to fall into your project. And because both of your hands will be busy with a needle and thread, you will be less inclined to answer texts or emails. 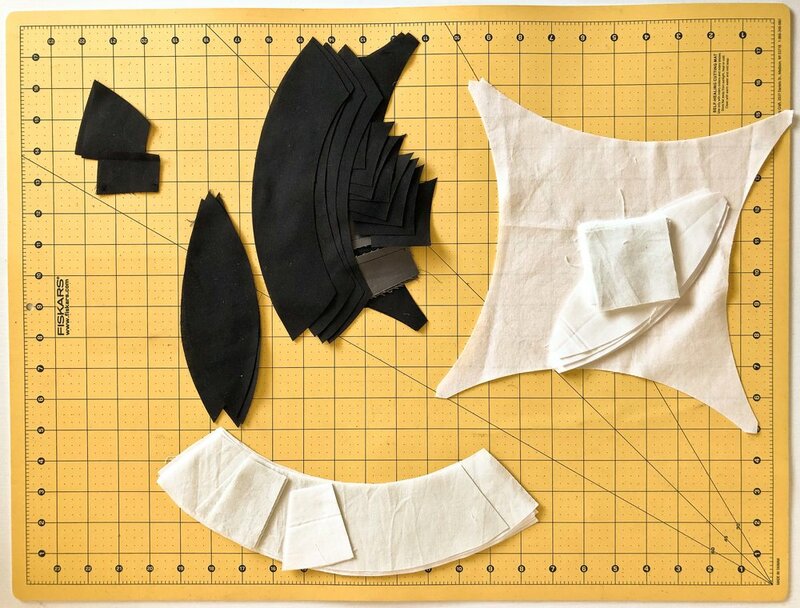 If you’re new to sewing, here are a few great tips on how to get started. It can be hard to find the time to exercise every day, but it’s important to stay active and get in a workout as often as possible. Having a hobby that gets you moving can help you stay active and improve your health, as well as reduce stress. There are many hobbies that help you give back to your community or to the charity of your choice; in fact, if you enjoy planning events and bringing people together, consider joining a fundraising group that will allow you to give back. There are quick and easy ways to raise awareness and spread your message through social media and email outreach. If you’re a knitter, maybe you can provide several afghan squares to Warm Up America. If you can crank out quilts in a flash, maybe there’s a lap quilt you can donate to a raffle or to a children’s hospital. Having a hobby can help you de-stress and get your emotions centered, so when you’ve had a long day, or a particularly tough week, work on your favorite hobby and feel the stress fall away. Pull out a sketch book and dream up your next quilt. If you’re not feeling like starting a new project, simply have fun pulling together a beautiful pile of fabrics from your stash; this can be a fun no-commitment creative exercise. "If we start thinking about that beneficial carryover effect day after day, year after year, it starts to make sense how leisure can help improve health in the long term. Stress causes a buildup of higher heart rate, blood pressure, and hormone levels, so the more we can prevent this overworked state, the less of a load it builds up,” says Dr. Matthew Zawadzki. Favorite Part of Quilt: I love this quilt so much, it can't be just one. New screen!!! I designed a new citrus pattern and made a screen of the one-color version to print on quilts. I love it!! I am so thankful that I have the resources at the College of Textiles to put patterns on acetate and then burn them onto screens. With new screen in hand, I printed a translucent white onto my springy mini quilt. Then I free-motion quilted around a trailing path of fruits and leaves and finished off the background with scattered aqua straight-line quilting. I love how it is turning out! I will definitely be trying more of these this summer. Next up is chopping this quilt into teeny minis and then finishing them with my serger! I have a new screen! It's a 12" x 12" square of graphic lines, and I love it! I masked out the bottom so that it would line up perfectly with two seams in my mustard Lenten Twelves One. Although I think my printing ink should've been a bit thinner to get in the crevices better, I like the overall effect, and I am excited to try it on more quilts! Right after printing Lenten Twelve One, I ironed this grey guy flat onto the printing board and printed him too! It is so fun to add movement with such a graphic statement atop a quilt. I didn't really mean for the second set of lines to perfectly align with the center of the quilt, but oh well! When you're sketching, sometimes your pencil lines don't quite go where you meant. When you're quilt sketching, I think the same is true. Seeing my collection of Lenten Twelves grow this year has been fun. I feel like I am stretching my creative boundaries with these quilt sketches, and I am having a last in the process! Last week, my sewing group started making quarter-square triangles out of scraps. We love to use scraps for charity quilts, and these quarter-square triangles are so easy and fun that we can't stop ourselves! I decided to include a tutorial so that you can join in on the fun too! 1. Cut 8 squares each 5"x5"
2. 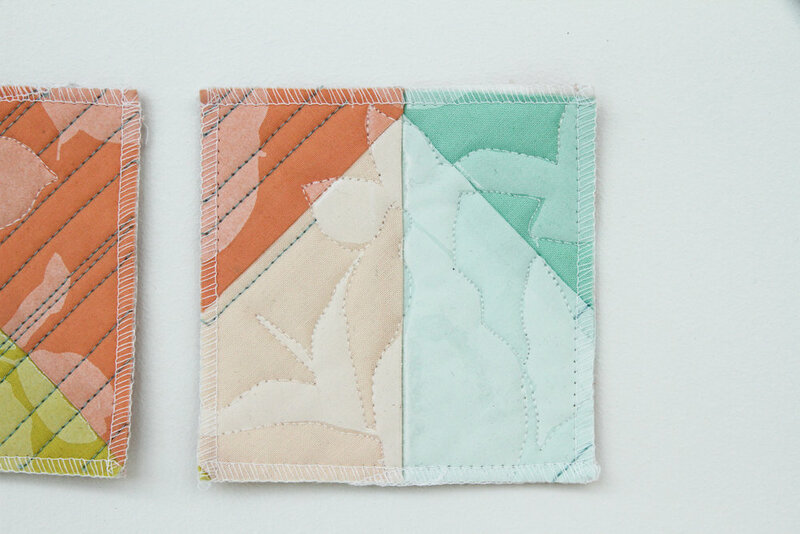 Sew your eight squares into two four-patches. 3. 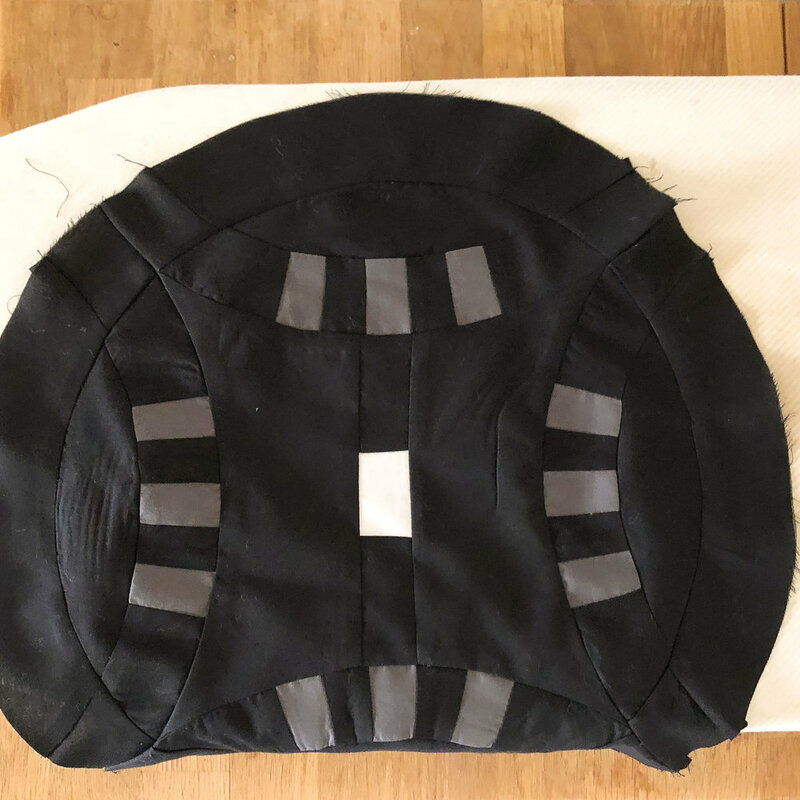 Place two four-patches right sides together and sew around the edges. 4. Cut across both diagonals of your connected four-patches. 5. Open up your quarter-square triangles and press! If you like to watch video tutorials, Jenny at the Missouri Star Quilt Co has an awesome and easy video explaining how to make these "super easy hourglass blocks." These blocks were featured in the most recent issue of Block, the quarterly project magazine put out by the Missouri Star Quilt Company. 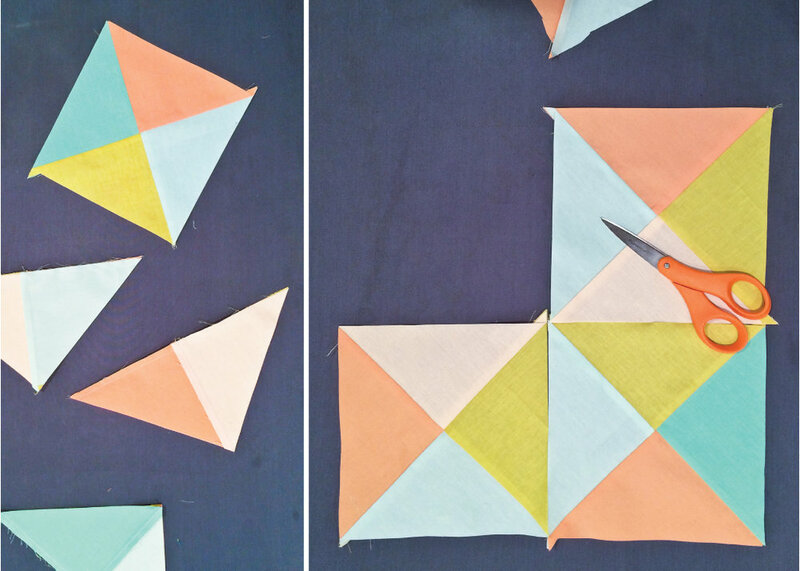 Let me know if you decide to make any quarter-square triangles with this method! I would love to see your projects. Just leave a comment for me here or tag me @lovelyandenough on Instagram. I hope you have as much fun as I am! This week's Lenten Twelve was a creative block. It wasn't the kind of block that hinders all ideas completely. It was the kind where one idea fills your mind so much that you can't think of anything else. After that, I could not stop thinking about QSTs in my favorite springy colors. Every time I tried to brainstorm a Lenten Twelve. Springy QSTs springy QSTs springy QSTs. So here they are! This block too will be overprinted in the next couple weeks. Check back to see some printed progress! My goal for each week of Lent is simply a quilt top. Designing, piecing, printing, quilting, and binding a mini quilt each week felt daunting! Especially considering I am traveling or busy every weekend of Lent but one. Do not get me wrong. I would not give up my weekend events: a retreat in the mountains, a Michigan wedding, and a conference on communicating science. However, to keep life sane, I decided to set reasonable expectations for myself this Lent. Piecing (and hopefully printing), a top each week feels manageable. Here is the top from Week One. I wanted to play with tone-on-tone and simulated transparency. The band across the middle inverts the two colors, creating interesting interactions between the shapes and colors at its borders. I particularly enjoy the mustard arrow in the second row that has one tan corner! The screens are not quite ready for printing, but I have put the grid designs onto transparent plastic and prepped two screens for exposure. Maybe I can print this weekend!! Follow along on Instagram @LovelyandEnough to see real-time progress! I am moving to Squarespace! Today!! Blogger has served me well, but I am excited for this new platform and the possibilities it offers. However, be aware that my site will be down today and possibly tomorrow. Since the entire blog is migrating, links, bookmarks, and bloglovin' should all still work perfectly once I have transferred and forwarded everything. Those of you subscribed by email may need to resubscribe. (Give me a week, and I will email you with instructions for resubscribing.) Thank you so much for your support over the five years I have been on blogger. Your readership and comments mean the world to me. Now, into a new adventure we go together! Layers of Charm. While I was very tempted by the prospect of new Cotton+Steel fabrics, I opted for a red flannel with black and white front. The quilt was a cinch to pull together! Just a charm pack and a layer cake and couple Saturday afternoons (more than one only because I enjoy being distracted by Netflix and such) and I had the coziest quilt ever! Did I mention that I used high loft batting for extra squish? Well, when my sister felt my quilt, she got a little jealous and has been bugging me to make her one ever since. This fall, I walked into Joann, saw their crazy soft flannels, and knew what I'd be making my sister for Christmas. With a buttery black and white flannel in hand, I went home, ordered the precuts, and then set about sewing. So many times I thought about keeping this quilt for myself and giving my sister the original. I debated with myself about giving a "used" gift, and then I debated whether you could really call a quilt "used." In the end, I decided to be the bigger sister and give away the cozy new one. But that was just the beginning of the saga of this quilt. The night before my early flight home, I had packed everything but the quilt. Before zipping my bag, I went to tuck the quilt in...and I couldn't find it. Anywhere. I realized that I must have left it at school because I had been hand-binding while I worked a couple days earlier. Since it was nearing midnight, I vowed to get up early and retrieve it. However, when I arrived at school, the quilt was in neither of the labs, nor my office. I double and triple checked to no avail! Dejectedly I went back to my apartment, unpacked the needle and thread I had tucked in my backpack to finish binding on the plane and waited for my friend to pick me up for the airport. I packed up my quilt to give to my sister instead. When my friend arrived, I climbed in the car and told her the story, how I was trying so hard to remember when I'd last seen the quilt that I literally couldn't remember anything about Thursday afternoon anymore. We were part way to the airport when she asked me if I had stopped in the bathroom before headed home. "YES!" I exclaimed. "I remember setting the quilt on the shelf in the bathroom and thinking, 'Wouldn't it be a bummer if I left it there?'" She turned around the car, racing back to school, and I found it on the shelf!! When we arrived at the airport, I unpacked my quilt from my bag and tucked my sister's inside (much easier to fit hers since I used regular batting for hers, and as you might remember I used high loft for mine). Unfortunately, I had unpacked the thread and needle to finish the binding on the plane, but luckily (?) both of my flights were delayed. I had time to check out every news stand in the airport to find a sewing kit and then sat contentedly in multiple airports binding up a storm. Needless to say, this quilt had quite the adventure, and as you can see below, its new owner is very happy to have received it. See the original black, white, and red flannel quilt here. This past month, I had the pleasure of chatting with the passionate modern quilters behind Patch-Work-Life. Patch-Work-Life is a Japanese brand that is working to promote modern quilting to creatives in Japan. Quilting is a dwindling art in Japan, but Patch-Work-Life has watched the resurgence of quilting as a modern handcraft in the United States and would like to see the same revival in Japan. 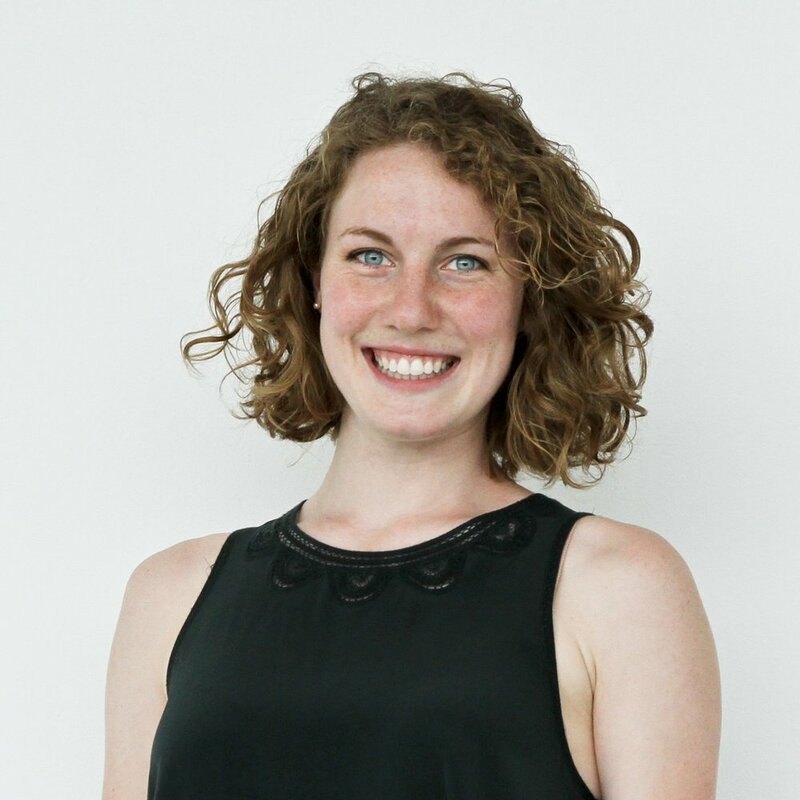 Hop on over to their website to learn a little bit more about me and my quilting philosophy and to see the lovely set of photos that the curated of my work! I can't get enough of the Modern Courthouse Baby quilt pattern. This is the fourth I have made. Someone needs to stop me. The pattern is just so perfect for highlighting a hand-printed panel while maintaining a minimal aesthetic. This little guy was happy to be my quilt model while we were hanging out one afternoon. I mean, who wouldn't rather lay on a quilt on a warm fall day than go car shopping with mom and dad? And how perfect that he was wearing such a fun citron diaper, since I didn't manage to sneak any citron into this quilt. Pudgy thighs, stylish cloth diaper, quilt to be photographed: it was a match made in quilting heaven. Sometimes picking out binding and backing can prove tricky, but with my hand-dandy quilt consultant (aka boyfriend) along, it went very smoothly. First, he pulled this lovely lightweight denim off the shelf at Joann that matched perfectly. Navy with a bit of a fleck, I could not have chosen better myself. Then when I sliced it up, I realized the fabric is automatically on the bias. That is what I call WINNING in the binding fabric department. For the back, I was hoping for a grey or navy lowkey print or solid. When the quilt consultant suggested robot for his nephew's quilt, I was rather skeptical. Robots? For a minimal modern quilt? However, after circling the store a second time, I started to appreciate the minimal nature of the robots he had chosen. As you can see below, robots won. This quilt should have arrived at is new home last week! I hope that the second little guy who gets to lie on it likes it just as much as the first. , illustrated by Vicki Turner, I sketched some holiday edibles and turned them into patterns! As the perfectionist I am, I also decided to create my own stock images to mockup my patterns, and these are the first two results. Although the patterns were just for fun, I have been finding myself wanting an garlic apron now... What about you? What would you do if you had a yard of one of these prints?